The primary use case for HoloBuilder is the creation of virtual tours for people working in construction and real estate agents. A virtual tour is a set of 360° photos that are interlinked within a HoloBuilder project. This makes it possible to virtually discover a place by “walking” from one photosphere to the other. 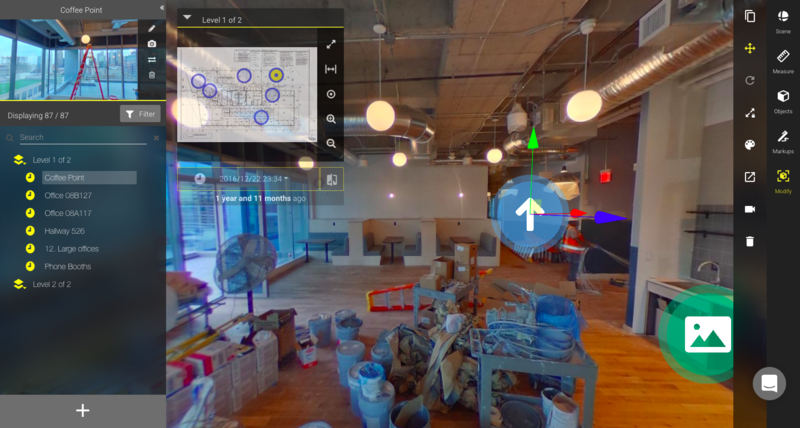 Get a quick overview of which steps you have to take to easily create a 360° tour with HoloBuilder. A crucial prerequisite for your virtual tour is a set of 360° photos of the place you want to make virtually accessible. 360° images can be captured by either using a dedicated spherical camera using the JobWalk app, as well as by using a mobile app for capturing 360° images with a smartphone, as it has been described in here. There are plenty of 360° cameras available. Please consult the list of cameras that are compatible with HoloBuilder, we recommend the Ricoh Theta V.
The easiest way to use HoloBuilder is by also using our JobWalk app. If you chose the JobWalk app to capture photos with a 360° camera you can easily upload all photos to your project from within the app. Please note you might have to connect to your WiFi again after your mobile device was connected to your 360° camera in order to upload. In case you do not want to use the JobWalk app or you already have 360° you can easily upload those though our web editor. To do so, launch the HoloBuilder Web Editor in your web browser, preferably Chrome. Once you are logged in press the '+' Button in the lower left corner to open the upload dialog. Click on the highlighted area in the tab ‘360° Scene’ and select the file to be uploaded. Alternatively, you can also drag and drop the files to be uploaded from your desktop onto the rectangular interaction area of the upload popup highlighted in green in the image below. Subsequently, your 360° images will appear in the left-hand project panel. Note: Add multiple photospheres at once by drag and drop or directly selecting them by browsing your files. 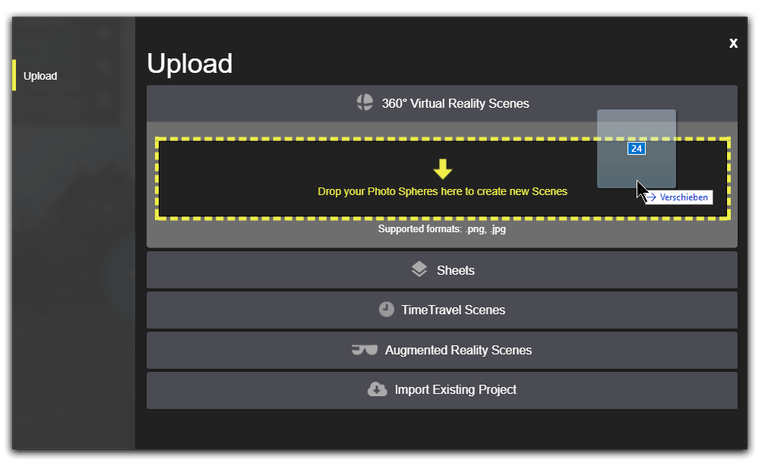 To interlink your uploaded 360° images, you can either drag and drop the scene you want to create a link to from the project panel into the scene or add the corresponding action object from the object menu. For a more customized solution, you can also add your personal object designs. When you drag and drop a scene from the project panel on the left-hand side of the editor into the main editor window, a virtual link to that scene will be created with the ‘Go to scene‘ action object. To do so, first select the scene you want to add the link object to. Now, click and hold the scene you would like to link to in the project panel and drag it to the desired location in your scene. A 2D arrow appears in the scene as depicted below. You should repeat this process and add links to all relevant scenes to provide a smooth experience. 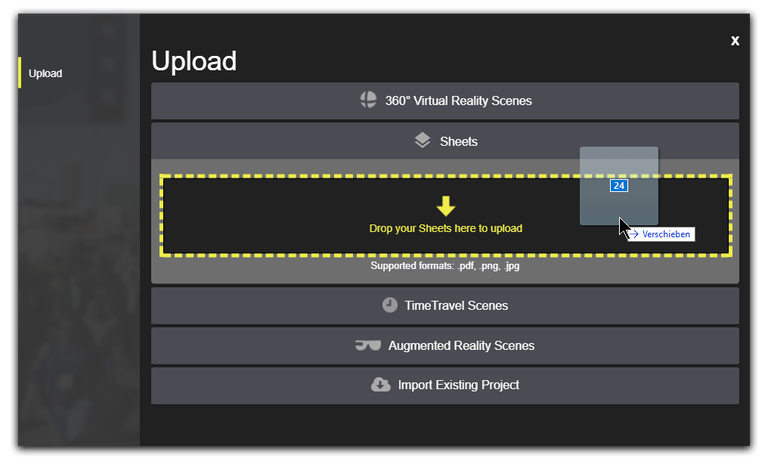 Apart from linking your scenes to an interactive tour, HoloBuilder also offers other options for enhancing your projects interactively, such as sheets and Time Travel. You can choose the perspective a viewer should have when first opening a scene. For setting the initial viewing direction when “entering” a photosphere, rotate the current scene to the corresponding orientation in the editor. Subsequently, click the camera icon located at the corresponding scene preview of the currently displayed photosphere in the project panel. The thumbnail displayed as scene preview will be updated to the new orientation. Learn more about setting the initial viewing direction for each scene here. Click on the + icon at the bottom left side of the screen. Now, select the second tab ‘Sheets’ and add your sheets, e.g. floor plans, by drag and dropping them from your local drive or by browsing your files. Learn more on how to add and edit sheets here. Add a single sheet with any of the paid plans. Starting with the Real Estate plan you will also be able to add Multiple Sheets. With HoloBuilder, any progress or changes can be easily documented and followed with the Time Travel feature. Time Travel allows you to add multiple iterations of a single scene over time to display changes and document progress. Learn more how to use Time Travel for your purpose here. To share your project, simply click on the share icon at the top of the editor, then, use either the share URL to distribute the tour via your various social media channels or the embed code to seamlessly integrate your virtual tour as an iframe within your website and any other HTML-based platform. Learn more about your sharing options here or how to responsively embed the iframe into your website with this tutorial.